A judge in Chile has sentenced 106 intelligence officers for the kidnapping and murder of 16 leftist activists in 1974 and 1975. Judge Hernan Cristoso said the activists had been arrested and sent to torture centres in Santiago. They were never seen alive again. Many of the agents are already serving prison sentences for other cases. 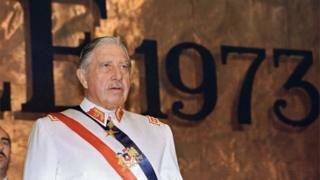 During General Pinochet's rule, from 1973 to 1990, some 3,000 people died or disappeared in Chile. Thousands of people were tortured or had to go into exile. Judge Cristoso sentenced the former intelligence officers to between 541 days and 20 years in jail. He also ordered the state to pay $7.5 million (£6.8 million) in compensation to the victims' families. Among the agents sentenced are two former generals, César Manríquez Bravo and Raúl Iturriaga Neumann, and several senior officers at the National Intelligence Directorate (DINA). Judge Cristoso said the Pinochet government had tried to cover up the disappearances, saying either that the victims had fled abroad or that they had been killed in fighting between rival leftist groups.